Failure in repair of DNA double-strand breaks (DSBs) could result in various disorders in mammals including cancer. Among various exogenous agents, radiation is one of the primary causes for induction of DSBs. Homologous recombination, nonhomologous end-joining, and a less efficient microhomology-mediated end-joining are responsible for repair of DSBs to ensure the genomic integrity and stability. 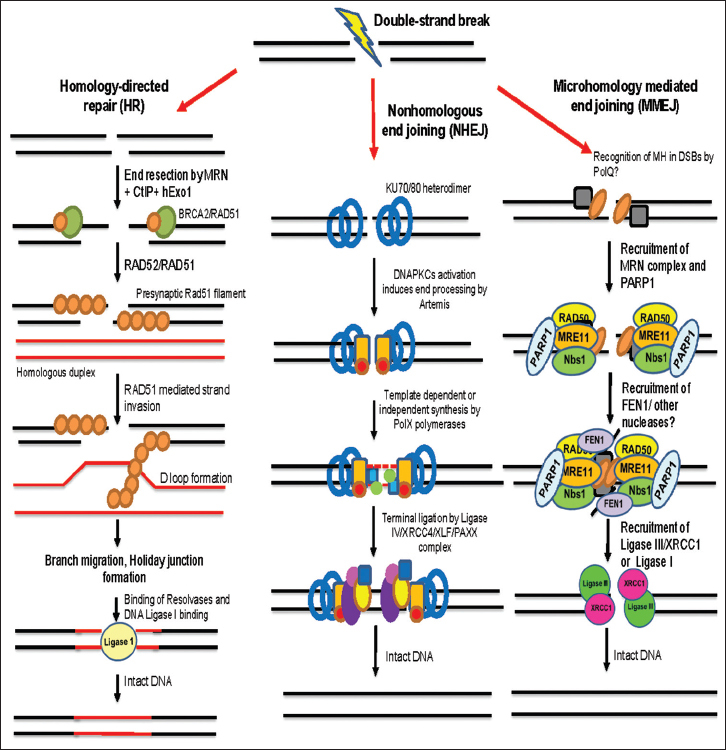 This review highlights DNA damage response (DDR) induced following various insults to the genome and how the DNA repair mechanisms have evolved to restore genomic integrity. We also briefly discuss the potential therapeutic targets associated with DDR and DSB repair and novel inhibitors developed against such targets and their well-defined mechanism of action, which may increase sensitivity to traditional radio- and chemo-therapeutic modalities. On induction, DSBs are detected by damage sensors, ataxia telangiectasia mutated (ATM) and ATM-Rad3- related (ATR) ATR, which also function as a signal transducers. ATM/ATR, with the aid of mediators, breast cancer-associated protein 1 (BRCA1), claspin, 53BP1, and MDC1, transduce the signal to transducers such as checkpoint kinase-1/2, which, in turn, activate or deactivate the effectors such as p53 that directly participate in cell cycle arrest and maintain a strong crosstalk with the DNA repair machinery as well [Figure 1]. To repair lethal DSBs, the mammalian cells employ two major mutually exclusive pathways, homologous recombination (HR), and nonhomologous end-joining (NHEJ), thereby maintaining genomic integrity [Figure 2]., NHEJ is an error-prone pathway, operative throughout the cell cycle, joins DSBs with no or minimal homology, whereas HR restores the genomic sequence duplex DNA precisely in diploid organism with cells in S and G2 phases of cell cycle, by utilizing sister chromatids as template for repair. The first protein to bind DSBs during NHEJ is KU70/80, which acts as a platform for the recruitment of downstream proteins, such as DNA-dependent protein kinase catalytic subunit (PKcs) and artemis (which processes damaged ends) and other end-processing enzymes.,, Template dependent and independent DNA synthesis step is carried out by DNA pol λ and μ polymerases, while the final step of ligation is catalyzed by a ternary complex of Ligase IV, X-ray repair cross-complementing protein 4 (XRCC4), and XRCC4-like factor (XLF). Recently, a novel DSB repair protein, PAralog of XRCC4 and XLF (PAXX), that shares structural and functional homology with XRCC4 was identified. It appears that PAXX is recruited to the site of DSBs in a KU-dependent manner within the cells and promotes binding of other NHEJ factors to the damaged sites [Figure 2]. In diploid organisms, HR-mediated DSB repair restores the genomic DNA sequence precisely during the S and G2 phases of cell cycle, by utilizing sister chromatids as templates for repair. During HR, 5' ends of DSBs are resected by a complex of MRE11, Rad50, and Nbs1 (MRN), hExo1, and CtIP proteins to generate 3' single-stranded overhangs. Rad51 binds to replication protein A (RPA). RPA-coated single-stranded DNA culminating into a complex called presynaptic filament. This is followed by strand invasion assisted by the same recombinase and its various paralogs, whereby search for homology initiates and the single strand gets base-paired with the complementary strand of the homologous chromosome to form a displacement structure called the “D-loop.” Using the complementary strand as template, single-strand DNA undergoes synthesis. Similarly, the other end is captured, the gap is filled in, and terminal ligation process occurs to mend the breaks in a highly accurate manner [Figure 2]. Therefore, mutations in functional HR pathway can lead to genomic instability and contribute to carcinogenesis. Although the machinery of MMEJ pathway is not completely defined, previous reports suggest the participation of proteins such as PARP1, Ligase III/XRCC1, Ligase I, MRN, and FEN1 in MMEJ. In one of the most comprehensive studies, a novel biochemical assay system utilizing DSBs flanked by varying lengths of direct repeats was developed to investigate both enzymatic requirement and DNA sequence dependence of MMEJ. Novel evidences have emphasized the indispensable role of C-terminal polymerase activity of the human polymerase POLQ (or Pol θ) in catalyzing alternative DNA end-joining in eukaryotes.,, It appears that Pol θ undergoes multimerization to facilitate synapsis of the broken DNA ends (using microhomologies upto 25 bp) or sequestering free DNA ends from engaging in classical NHEJ., Although independent studies suggest the involvement of multiple proteins using gene knockdown or knockout strategies, their specific role in different steps is yet to be defined [Figure 2]. One remarkable pathological agent that has recently been discovered to significantly enhance MMEJ is the organochlorine pesticide, endosulfan that has known to be a persistent environmental pollutant with speculated untoward effects on humans,, inducing intense DNA damage and genomic instability. 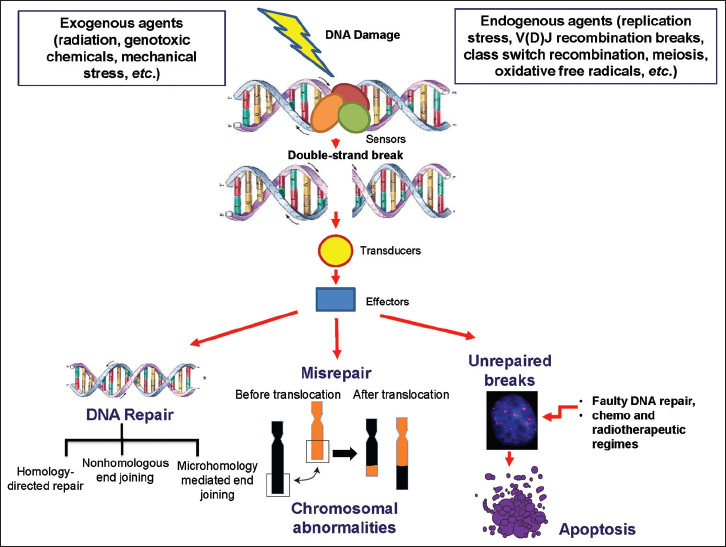 Radio- and chemo-therapy largely rely on accumulation of DNA damage in cancer cells yet are accompanied by significant damage to the surrounding normal tissues. In addition to these well-established ways for treating cancer, there is a dire need to develop targeted therapy based on different mechanisms of DDR restricted to cancer cells. DSB repair genes are known to be upregulated in many cancers, which become one of the reasons for chemo- and radio-resistance in patients. Furthermore, there are cases in which enhanced mutation rate due to compromised DNA repair results in downregulation of tumor suppressors such as BRCA1/2. Therefore, targeting DDR by specifically abrogating DSB repair in cancer cells is emerging as an attractive strategy to eliminate cancer. Reports suggest that increased activities of DNA repair proteins can predispose the cells to cancer., However, a defective repair pathway and the ability of synthetic compounds to inhibit or activate DNA repair can also govern a patient's response to therapy. Among the well-known DNA repair inhibitors, mirin is extensively used as biochemical inhibitor of MRE11 while Wortmannin is developed against DNA-PKcs as a pan PI3K inhibitor. An attractive target Ligase IV has been extensively explored for its anticancer therapeutic value. A major breakthrough came in the form of a potent and specific Ligase IV inhibitor named as SCR7, which can inhibit NHEJ both in vitro and ex vivo in a ligase IV-dependent manner. SCR7 served as one of the best examples of anticancer therapeutic strategy targeting DSB repair and exhibiting synergistic effects with radio- and chemo-therapeutic agents. Besides, a nanomaterial-encapsulated version of SCR7 inhibited NHEJ leading to ~5-fold increase in cell death. Two other compounds, SCR17 and SCR21, have been recently identified using in vitro and ex vivo assays to specifically inhibit nick ligation activity of DNA Ligase I, thus affecting replication in cancer cells. The ultimate goal in the field of cancer therapeutics is strategic synergism of repair inhibitors coupled with genotoxic agents such as ionization radiation. This will help in sensitizing cancer cells even with low dose of radiation and chemotherapeutic agents, hence reducing the side effects and overcoming the problem of resistance. MP is supported by Senior Research Fellowship from IISc, India. Friedberg EC, Aguilera A, Gellert M, Hanawalt PC, Hays JB, Lehmann AR, et al. DNA repair: From molecular mechanism to human disease. DNA Repair (Amst) 2006;5:986-96. Ciccia A, Elledge SJ. The DNA damage response: Making it safe to play with knives. Mol Cell 2010;40:179-204. Srivastava M, Raghavan SC. DNA double-strand break repair inhibitors as cancer therapeutics. Chem Biol 2015;22:17-29. Zhu Z, Chung WH, Shim EY, Lee SE, Ira G. Sgs1 helicase and two nucleases Dna2 and Exo1 resect DNA double-strand break ends. Cell 2008;134:981-94. Nambiar M, Raghavan SC. How does DNA break during chromosomal translocations? Nucleic Acids Res 2011;39:5813-25.
d'Adda di Fagagna F, Reaper PM, Clay-Farrace L, Fiegler H, Carr P, Von Zglinicki T, et al. A DNA damage checkpoint response in telomere-initiated senescence. Nature 2003;426:194-8. Kang C, Xu Q, Martin TD, Li MZ, Demaria M, Aron L, et al. The DNA damage response induces inflammation and senescence by inhibiting autophagy of GATA4. Science 2015;349:aaa5612. Kanaar R, Wyman C, Rothstein R. Quality control of DNA break metabolism: In the 'end', it's a good thing. EMBO J 2008;27:581-8. Lieber MR. The mechanism of double-strand DNA break repair by the nonhomologous DNA end-joining pathway. Annu Rev Biochem 2010;79:181-211. Gottlieb TM, Jackson SP. The DNA-dependent protein kinase: Requirement for DNA ends and association with Ku antigen. Cell 1993;72:131-42. Smith GC, Jackson SP. The DNA-dependent protein kinase. Genes Dev 1999;13:916-34. Sharma S, Choudhary B, Raghavan SC. Efficiency of nonhomologous DNA end joining varies among somatic tissues, despite similarity in mechanism. Cell Mol Life Sci 2011;68:661-76. Ochi T, Blackford AN, Coates J, Jhujh S, Mehmood S, Tamura N, et al. DNA repair. PAXX, a paralog of XRCC4 and XLF, interacts with Ku to promote DNA double-strand break repair. Science 2015;347:185-8. Deriano L, Roth DB. Modernizing the nonhomologous end-joining repertoire: Alternative and classical NHEJ share the stage. Annu Rev Genet 2013;47:433-55. Schatz DG, Swanson PC. V(D)J recombination: Mechanisms of initiation. Annu Rev Genet 2011;45:167-202. Moshous D, Callebaut I, de Chasseval R, Corneo B, Cavazzana-Calvo M, Le Deist F, et al. Artemis, a novel DNA double-strand break repair/V(D)J recombination protein, is mutated in human severe combined immune deficiency. Cell 2001;105:177-86. Buck D, Malivert L, de Chasseval R, Barraud A, Fondanèche MC, Sanal O, et al. Cernunnos, a novel nonhomologous end-joining factor, is mutated in human immunodeficiency with microcephaly. Cell 2006;124:287-99. Kerzendorfer C, O'Driscoll M. Human DNA damage response and repair deficiency syndromes: Linking genomic instability and cell cycle checkpoint proficiency. DNA Repair (Amst) 2009;8:1139-52. Heyer WD, Ehmsen KT, Liu J. Regulation of homologous recombination in eukaryotes. Annu Rev Genet 2010;44:113-39. McVey M, Lee SE. MMEJ repair of double-strand breaks (director's cut): Deleted sequences and alternative endings. Trends Genet 2008;24:529-38. Sharma S, Javadekar SM, Pandey M, Srivastava M, Kumari R, Raghavan SC. Homology and enzymatic requirements of microhomology-dependent alternative end joining. Cell Death Dis 2015;6:e1697. Sfeir A, Symington LS. Microhomology-mediated end joining: A back-up survival mechanism or dedicated pathway? Trends Biochem Sci 2015;40:701-14. Chan SH, Yu AM, McVey M. Dual roles for DNA polymerase theta in alternative end-joining repair of double-strand breaks in Drosophila. PLoS Genet 2010;6:e1001005. Roerink SF, van Schendel R, Tijsterman M. Polymerase theta-mediated end joining of replication-associated DNA breaks in C. elegans. Genome Res 2014;24:954-62. Yousefzadeh MJ, Wyatt DW, Takata K, Mu Y, Hensley SC, Tomida J, et al. Mechanism of suppression of chromosomal instability by DNA polymerase POLQ. PLoS Genet 2014;10:e1004654. Cho NW, Greenberg RA. DNA repair: Familiar ends with alternative endings. Nature 2015;518:174-6. Sebastian R, Raghavan SC. Induction of DNA damage and erroneous repair can explain genomic instability caused by endosulfan. Carcinogenesis 2016;37:929-40. Sebastian R, Raghavan SC. Endosulfan induces male infertility. Cell Death Dis 2015;6:e2022. Lieberman HB. DNA damage repair and response proteins as targets for cancer therapy. Curr Med Chem 2008;15:360-7. Powell SN, Bindra RS. Targeting the DNA damage response for cancer therapy. DNA Repair (Amst) 2009;8:1153-65. Begg AC, Stewart FA, Vens C. Strategies to improve radiotherapy with targeted drugs. Nat Rev Cancer 2011;11:239-53. Dupré A, Boyer-Chatenet L, Sattler RM, Modi AP, Lee JH, Nicolette ML, et al. A forward chemical genetic screen reveals an inhibitor of the Mre11-Rad50-Nbs1 complex. Nat Chem Biol 2008;4:119-25. Oliveira NG, Castro M, Rodrigues AS, Gil OM, Toscano-Rico JM, Rueff J. DNA-PK inhibitor wortmannin enhances DNA damage induced by bleomycin in V79 Chinese hamster cells. Teratog Carcinog Mutagen 2002;22:343-51. Srivastava M, Nambiar M, Sharma S, Karki SS, Goldsmith G, Hegde M, et al. An inhibitor of nonhomologous end-joining abrogates double-strand break repair and impedes cancer progression. Cell 2012;151:1474-87. John F, George J, Vartak SV, Srivastava M, Hassan PA, Aswal VK, et al. Enhanced efficacy of pluronic copolymer micelle encapsulated SCR7 against cancer cell proliferation. Macromol Biosci 2015;15:521-34. Pandey M, Kumar S, Goldsmith G, Srivastava M, Elango S, Shameem M, et al. Identification and characterization of novel ligase I inhibitors. Mol Carcinog 2017;56:550-66.